A quick turn off hectic US 19 will reward you with a delightful visit to New Port Richey. Nestled along the banks of the Pithlachascotee (Cotee) River is a bit of Roaring 20s Florida. Yes, New Port Richey was a magnet for the rich and famous of the 1920s, including silent screen star, Thomas Meighan, and famous golfer, Gene Sarazen. It is still a great place to explore. These stars of yesteryear pictured the area as the “Hollywood of the East,” building beautiful homes along the river and historic buildings in the downtown. One of the more famous buildings is the Hacienda Hotel, where movie stars would winter. It was designed by Thomas Reed Martin and opened in 1927. The Mission Revival architecture bones are still there, but the hotel has fallen into disrepair over the years, as it sold several times, a was converted to an ACLF in 1986, and then closed for several years. One of the wonderful arches in the interior of the Hacienda Hotel building. Recently, the Hacienda Hotel property was purchased for renovation and I was privileged to tour the property. I happily discovered that most of its architectural embellishments have been kept in decent repair. I wonder whose coat of arms is displayed over the ornate plaster mantle above a fireplace. 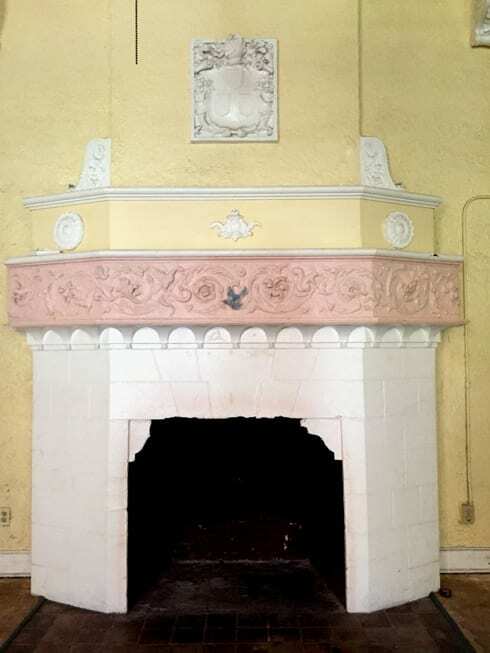 A fireplace in the Hacienda Hotel building, giving an example of the magnificent plasterwork that has survived its many owners and business incarnations. Note the family crest above the fireplace. On Oct. 24, 1996, the Hacienda Hotel was added to the National Register of Historic Places. Many say the old hotel is haunted but I could not find any real “proof.” There is a “secret” floor that can be accessed from outside, or from a door in the kitchen. It’s called the Bordello. Additionally, there is a tunnel (no longer accessible) that goes out to the river where liquor and “ladies” could be smuggled in during Prohibition. The Hacienda Hotel was built of “hollow tiles,” an architectural process that was popular in the 1920s. The hollow tiles are covered with stucco and painted for its Spanish style. 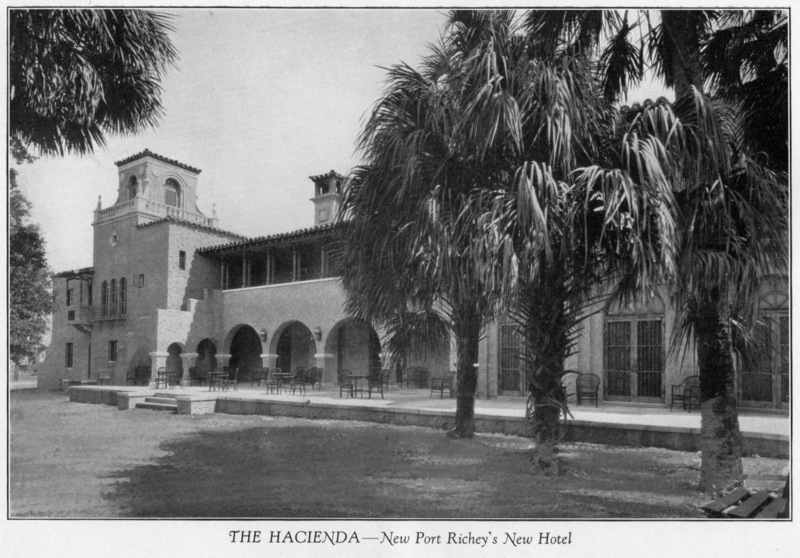 In 2014 the Florida legislature allocated $1 million toward the restoration of the Hacienda. 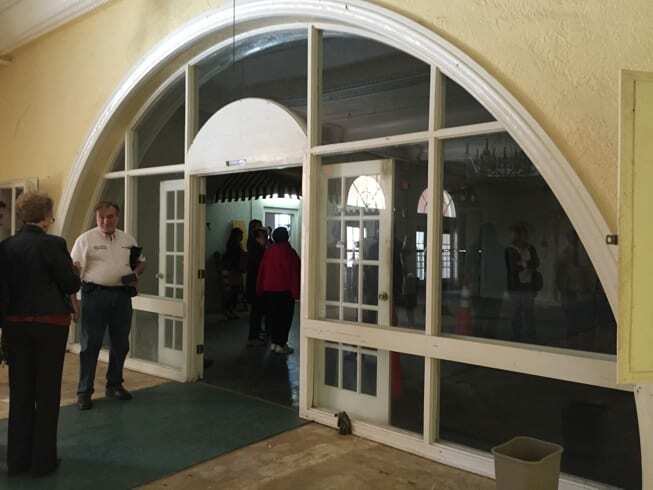 To see how this historic building has brought New Port Richey citizens and government entities together, watch this video from the Suncoast News’ Carl Orth. There are murals on several of the downtown buildings, and they are fun to explore. My favorite is the one at the corner of Main and Bank Street, entitled, “A 1920’s Day on the Pithlachascotee River,” by Keith Goodson, because it uses local people’s faces on the 1920’s characters. If you visit, there is a plaque on the mural that names all the participants and I like the idea of marrying past and present. Still, all the downtown murals are very good and worth a gander. In addition to the murals, the river and the historic buildings, New Port Richey’s downtown area has Sims Park which borders the river, the Hacienda Hotel and Main Street, reaching over to Orange Lake. Sims Park has a nice outdoor amphitheater and several festivals are held there each year with live music, vendors, and activities for residents and visitors. One of the main groups that puts these festivals on is Greater New Port Richey Main Street. My favorite is the Cotee River Seafood & Blues Festival because I love the blues and seafood. It is usually held near the end of April each year. 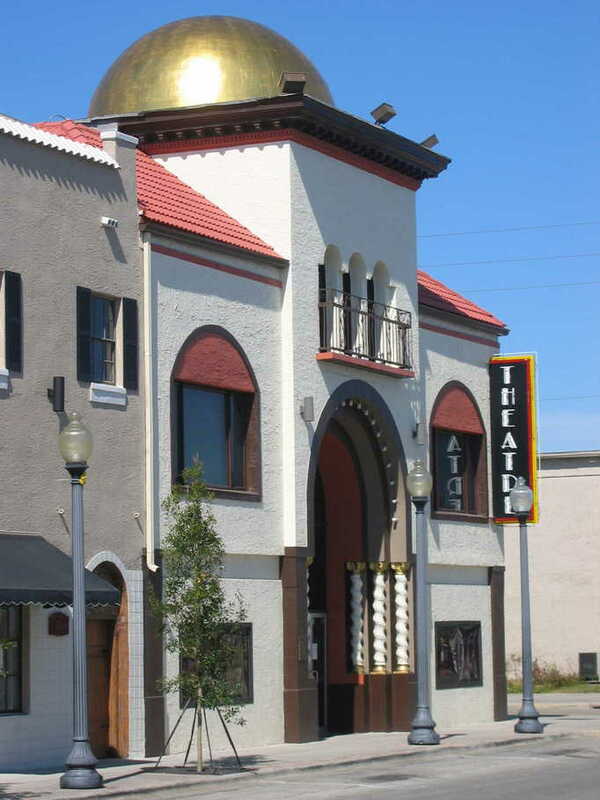 The Richey Suncoast Theatre is historic, having been built in 1925 at a cost of $60,000 and named the Meighan Theatre after Thomas Meighan. It opened with his silent film, The New Klondike. 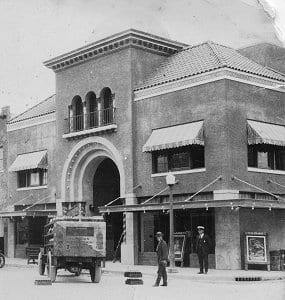 A pipe organ was installed in 1927 and the theater was the center of a controversy about being open on Sundays in New Port Richey. A January 4, 1927 vote of the city’s citizens kept the venue open Sundays, along with baseball games being ok, but not dancing. In 1930, a “sound system” was installed at the theater and sound movies made their debut. The Great Depression hit and in 1934 the magnificent theater was closed. Like the Hacienda Hotel, this extravagant building would be bought, sold, managed and change hands many times over the ensuing years. 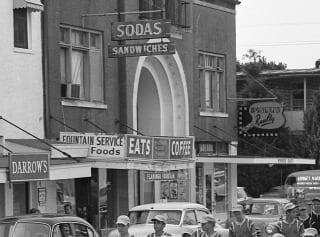 In 1972, the theater was renamed The Richey Suncoast Theater and community theater featuring live performances began. In 2007, a complete remodel was done on the theater’s tired interior, including air conditioning vents, lighting, carpet, walls, and seating. The exterior was repainted and the gold dome reguilded also. It is beautiful and functional once again. The live theater is active today and it is great fun to visit downtown and see a local production. Their schedule can be found here. The Richey Suncoast Theater today. There several nice restaurants and taverns in the downtown area, ranging from the home-style Greek food at Christina’s Restaurant to Dulcet, a very upscale restaurant, and lounge, offering live music, requiring proper dress, and impressing everyone with their spectacular food and atmosphere. Who says you can’t put a high-end juke joint in a historic downtown? There is pizza, fresh soups and salads, and a traditional tea room which requires reservations for high tea, but provides a quiet room for walk-ins to sit down and enjoy a pot of fresh-brewed flavor. Several bars and pubs serve food as well as beer, wine, and cocktails. An ice cream parlor, bakery, coffee shop, and shaved ice store fill out a nice mix. 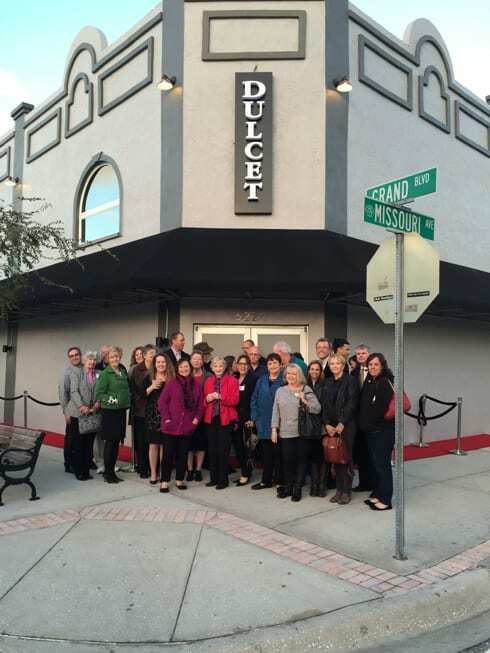 After renovating a broken down building at Grand and Missouri, the Dulcet opened December 31, 2014. Greater New Port Richey Main Street proudly presented the owners with their Downtown Beautification Award. Sims Park, a favorite for events and concerts is right on the banks of the Pithlachascotee and runs behind the Hacienda. It houses a nice playground, including handicapped-accessible equipment, a bandshell, and boat launches. A great library is downtown and several blocks north of the library is a recreation and aquatic center with multiple pools, workout equipment, meeting rooms and more. Back to the beginning of this post. Take a turn off US 19 at Main Street and enjoy one of the Nature Coast’s more famous cities: New Port Richey. Then let us know what your favorite part is.